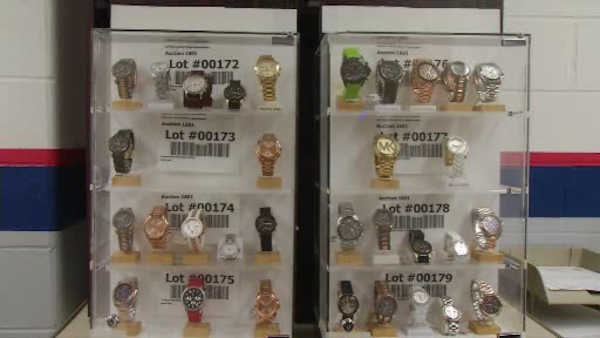 YAPHANK, Long Island (WABC) -- If you're in the market for a new watch, a new bike or new jewelry, you could get a deal from -- the Suffolk County Police Department. On Wednesday the Department will hold one of its annual auctions. The items seized are from drug raids and cases that have now closed with no way to return the items to the original owner. The money raised goes to support local community programs. The department holds about four of these auctions every year, generating about $100,000 in revenue. "Many people enjoy our auctions, it's another way that we perform outreach to the community, to connect with them and provide a benefit to them by selling them items that they may not be able to purchase, and to benefit the residents of Suffolk County by generating revenue for the poor and other vital causes here in Suffolk County," said Suffolk County Police Captain Christopher Bergold. The auction will take place at 9:30 Wednesday morning at the department's property bureau located at 30 Yaphank Avenue in Yaphank.